Between moving, leaving our jobs, and becoming pregnant, we have veritably Kicked Up the Dust. If our hearts are a home, we picked up the dirty rugs, beat 'em real good, swept the floor and carried on (rugs in tow . . . I would never leave the rugs). Ever a fan of the metaphor. But we did literally make that move, not just metaphorically. And now the dust is settling. There is much left to discover and even more to discern, but I can say with a good solid amount of clarity that Mark, baby and I are charting the right course. I do not know how to explain how a house can take care of someone—repair someone, even—but this is quietly, very quietly, happening. We moved back to Ohio and into my grandma's house two months after she died. This was not the plan. The plan was to move in with her. I felt collapsing sorrow when she died despite knowing she is imprinted on my soul + lives, without suffering, brightly in my memory. But to know me is to know how much I cherish the women who raised me. Long before we had any notion of moving back to Ohio, when we imagined farming in Vermont for years and raising babies in the green mountains, my grandma sent us a piece of mail entitled "after thoughts" which was a pros and cons list of moving in with her. Pros included things like "running hot water" (a luxury we did not have at the time); cons such as "old woman hard of hearing" (ha!). A year later, she's gone and I'm sitting in her kitchen; my kitchen. At the top of the stairs lives "after thoughts", framed and hung with prominence. It is something of a tangible reminder that opportunities can be subtle, can be sweet, can be written with shaky cursive on a scrap piece of paper (in the case of "after thoughts"). It gives me reason to suspect that even when we're not open to them, opportunities might just come back around. And I love this. As for the house, it is imbued with my grandma, the kitchen most of all. The thick plaster walls are home to some of her best paintings—like the mama goose and her gosling (pictured above; It is a particularly poignant painting for me, because Mark calls me Goose and we both call the baby our Gosling. It feels as though she made that painting to encourage my own journey into motherhood. I hold firmly that these things are not coincidental. 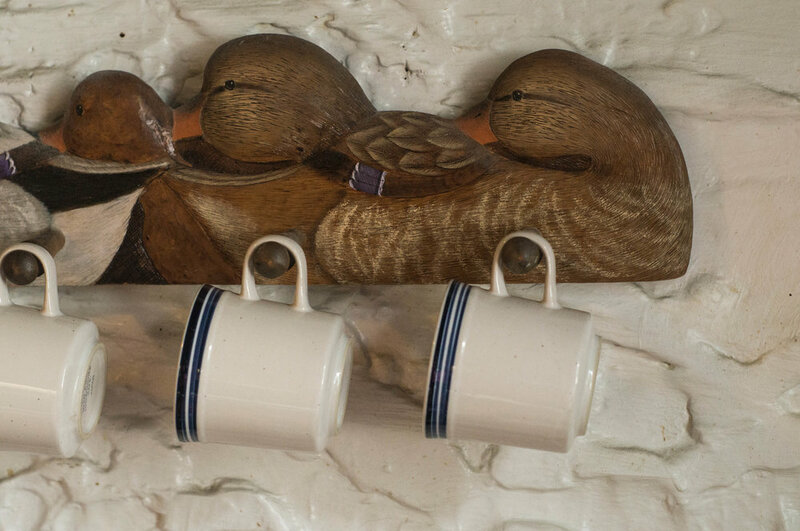 ), or the wood-burned peg rack of a paddling of ducks that has hung in the same spot my entire life. 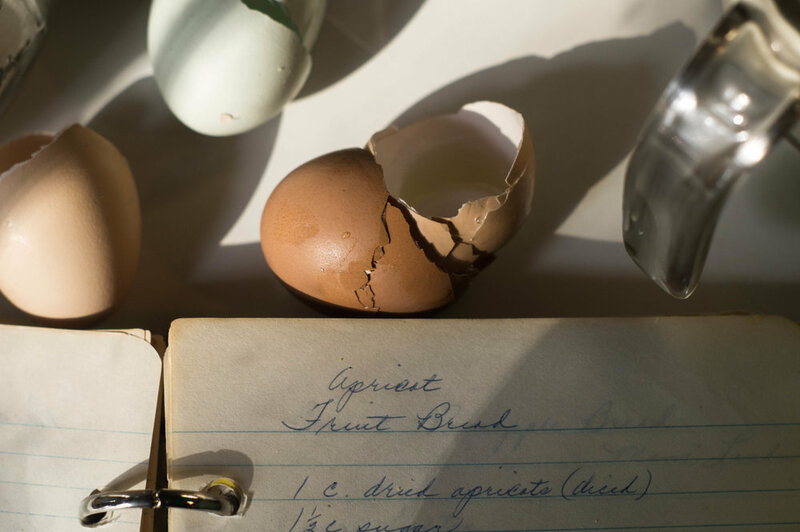 When she died, I was gifted her great-grandmother's 100-year-old quilt and her recipe book. Both are treasures worth more than gold. I christened her oven by baking a recipe from her book that I had never tasted: apricot fruit bread. I did not alter a single ingredient, which means I used shortening in lieu of butter or oil. And you should too, if you give it a try. And you should give it a try, because recipes only make it into grandmother's cookbooks if they are time-tested and Very Delicious. —Preheat oven to 350 degrees F.
—Cover apricots and prunes (raisins, etc) with hot water and let sit for 5 minutes; drain and set aside. —Cream together the sugar and shortening for 3-5 minutes. —Add eggs and beat until light in color. —Sift the dry ingredients together and add to the eggs alternately with the milk. —Stir in the fruit and nuts. —Pour into greased and floured 9x5 pans and bake 60-65 minutes. —Cool in pans for 10 minutes before removing to a cooling rack.